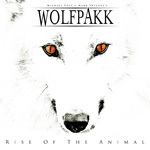 For this review of Wolfpakk's latest, Rise of the Animal, I was more than a little tempted to send you over to my previous review of 2013's Cry Wolf. Or maybe merely copy and paste those words into here and just change a few words. But that would be too easy. All that prelude is to say that Wolfpakk principals vocalist Mark Sweeney and guitarist Michael Voss are simply doing the same thing as before. They write a bunch of song and then get a bunch of heavyweight players from the hard rock and heavy metal universe to help bring them to life. Once more, they also offer a link to the various players and lyrics for the album at their website. Be sure to check it out. Also, as with the previous album, vocals are done in a tag team fashion: the guest singing with both Voss and Sweeny. And it seems that the prerequiste to performing on this album was that Sweeny and Voss asked their vocalists to sound as gnarly and raw as possible. 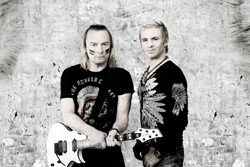 You get that right at the start with Helloween's Andi Deris assisting the Wolfpakk; it's nasty raw, even somewhat harsh. But it fits, I think this album is way more heavy metal than the previous album. The riffs heavier, the guitar sharper, with many songs having the speed of power metal. Yet as with the previous album, the metal is both bulked up and tempered by melody, harmony, and an abundance of rock groove. And the songs where this comes through are the best here, like Sock It To Me, Monkey On Your Back, or High Roller. But there are other songs of note. One is the longer title cut where Wolfpakk goes for the sound of epic power metal, with Michael Kiske. I'm not surpised if some might think it's a Unisonic song. Another fine song is Highlands. It has a slight symphonic start, but develops into this quick-paced groove monster and finishes with bagpipes. Yup. You read that right. Then there are the songs that didn't quite connect like Universe. An intended anthem, Michaela Schober's female vocals take a huge beating in the mix. Another is Grizzly Man, where the generally plodding pace defeats an energy. Nevertheless, in the end, Rise of the Animal, though developed in the same Sweeny/Voss formula, is probably a step forward for the project, especially in turns of being more heavy metal. Recommended. Rise of the Animal, though developed in the same Sweeny/Voss formula, is probably a step forward for the project, especially in turns of being more heavy metal. Recommended.